When it comes to troubleshooting issues in the Gluu Server-from service hiccups to outages-logs are the best place to start. The Gluu Server administrator can investigate logs from the oxTrust View Logs feature or directly with SSH access to the Gluu-Server container. 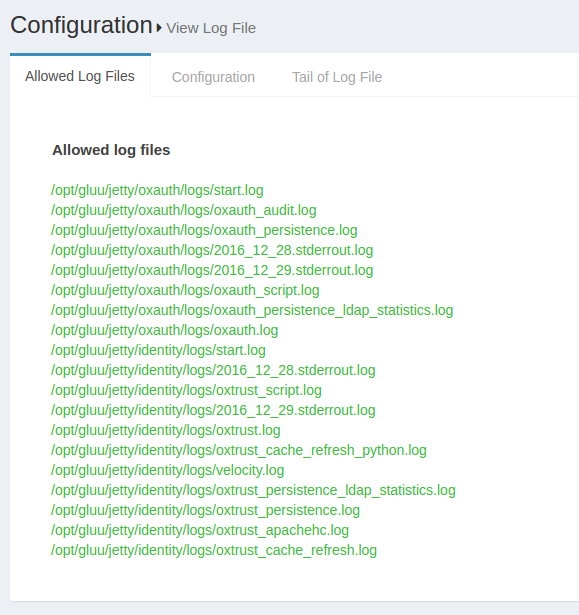 Previously configured log files can be viewed using the View log file feature. This feature can be accessed through the configuration menu using Configuration --> View Log File. The Display last lines count field contains the lines that will be displayed in the Web GUI. If the field contains the value 400, then the Gluu Server will show the last 400 lines of the log in the GUI. The screenshot below shows an according example. These logging levels can also be set in oxTrust UI. Login to oxTrust UI as admin or with an administrator account. Navigate to Configuration > JSON Configuration > OxTrust Configuration Tab. Scroll to the very bottom of the page. Click on the logging level and select the levels from the drop down. Default value will be set to Default, you can change the level as per your requirement for extensive troubleshooting. Click on Save Configuration to save the configuration. Gluu Server logs use the log4j2 logging levels which can be changed in the log4j2.xml file. The following files define the log levels in Gluu Server. Please edit the file with the levels given above and restart the jetty server. The following section is taken from a live Gluu Server log4j.xml file showing different log levels for different logs. The changes made this section will reflect in the logs. It is recommended to use OxTrust UI to change the logging levels. The available log files for Gluu Server Community Edition inside the chroot environment are listed below. /opt/shibboleth-idp/logs/idp-process.log IDP diagonostic log Read more..
/opt/shibboleth-idp/logs/idp-audit.log General audit log Read more..
/opt/shibboleth-idp/logs/idp-consent-audit.log Consent audit log Read more.. The oxAuth logs contain the information about oxAuth authentication process and errors. This log contains information on the total execution times for LDAP operations such as add and search. It records at the DEBUG level, so it does not affect production environment performance. This log collects information on oxTrust related scripts and their operations. For example, if an organization uses a custom attribute which populates values for every user, then the Gluu Server Administrator needs to use a custom script for their 'Cache Refresh' process. This log will receive information when the custom script runs. Cache Refresh related information such as status, primary failure, etc., is available in this log. In the sample snippet below we see the total number of users that have been synced into the Gluu Server, number of failures, and total number of updated users. Sometimes it's worth checking system logs like /var/log/messages. These logs contain global system messages. Apache httpd / apache2 logs are available in /var/log/httpd or /var/log/apache2 for Ubuntu. access_log: This log contains information about requests coming into the Gluu Server, success status or requests, execution time for any request etc. error_log: This log shows error messages if the web server encounter any issue while processing incoming requests. test.gluu.org:443 192.168.201.184 - - [17/Jul/2016:18:25:21 +0000] "GET /index.html HTTP/1.1" 200 13239 "-" "Java/1.7.0_95"
test.gluu.org:443 192.168.201.1 - - [17/Jul/2016:18:25:56 +0000] "GET / HTTP/1.1" 302 2185 "-" "Mozilla/5.0 (Windows NT 10.0; WOW64) AppleWebKit/537.36 (KHTML, like Gecko) Chrome/51.0.2704.106 Safari/537.36"
test.gluu.org:443 192.168.201.1 - - [17/Jul/2016:18:25:56 +0000] "GET /identity/ HTTP/1.1" 200 583 "-" "Mozilla/5.0 (Windows NT 10.0; WOW64) AppleWebKit/537.36 (KHTML, like Gecko) Chrome/51.0.2704.106 Safari/537.36"
test.gluu.org:443 192.168.201.1 - - [17/Jul/2016:18:25:56 +0000] "GET /identity/home.htm HTTP/1.1" 302 272 "https://test.gluu.org/identity/" "Mozilla/5.0 (Windows NT 10.0; WOW64) AppleWebKit/537.36 (KHTML, like Gecko) Chrome/51.0.2704.106 Safari/537.36"
test.gluu.org:443 192.168.201.1 - - [17/Jul/2016:18:25:56 +0000] "GET /identity/login?cid=4 HTTP/1.1" 302 474 "https://test.gluu.org/identity/" "Mozilla/5.0 (Windows NT 10.0; WOW64) AppleWebKit/537.36 (KHTML, like Gecko) Chrome/51.0.2704.106 Safari/537.36"
test.gluu.org:443 192.168.201.1 - - [17/Jul/2016:18:25:56 +0000] "GET /oxauth/authorize?scope=openid+profile+email+user_name&response_type=code+id_token&nonce=nonce&redirect_uri=https%3A%2F%2Ftest.gluu.org%2Fidentity%2Fauthentication%2Fauthcode&client_id=%40%21EFCB.890F.FB6C.2603%210001%210A49.F454%210008%21F047.7275 HTTP/1.1" 302 450 "https://test.gluu.org/identity/" "Mozilla/5.0 (Windows NT 10.0; WOW64) AppleWebKit/537.36 (KHTML, like Gecko) Chrome/51.0.2704.106 Safari/537.36"
There are few other logs like ssl_access_log , ssl_error_log , and ssl_request_log which are collecting information on port 443 specifically. OpenLDAP logs are enabled by default. And OpenLDAP by is configured to capture logs by syslog from the operating system. However, if one has to disable logging (which we dont recommend), are done in sladp.conf stored under following directory. The logs for OpenLDAP are stored under the below directory. By default Log Level of OpenLDAP is set to stats sync. If one has to change the log level, it could be performed by modifying the slapd.conf file under the above mentioned directory. The "clear-logs" feature can be used to clear all log files with the extension .log, including system logs. Clear-logs can be helpful during troubleshooting, as well as research and development. We discourage its use in production systems if the logs are not backed-up. More features are planned. Please consider this as work in progress.